Just Jessie B: Butternut Squash Oven "Fries"
First things first, let's throw a few things out there: Potatoes get crispy in the oven. Squash does not. I went on a mission to make this happen-- crispiness, that is. And I pulled out all the stops to get my squash ACAP (as crispy as possible)! The result turned out better than I hoped! Still not as crispy as you could get a potato, but an excellent substitute if you're not diggin' super starchy foods. Flavor is another one-up butternut squash has got on potatoes. Combined with a little sweet (cinnamon) and a little heat (chili powder), with some savory garlic? Topped with a pinch of sea salt? So tasty- and the perfect side dish for pretty much whatever. I like to think of these little babies as "fork fries". Because though they get firm & crispy enough to eat with your fingers, a fork works even better and gets them in your mouth faster. Does that make them "fast food"?! Anyway, I hope you enjoy these super tasty oven fries! Pair them with your next steak dinner, or make them as a appetizer for snackin'. And if you can find pre-cut butternut squash- do it! The peeling/cutting is worth it, but it's also the hardest part. Peel the squash & cut it in half lengthwise. Remove the seeds, and slice the squash into 1/4" to 1/2" fries. Place the cut fries in a large bowl or plastic bag, and toss with flour to coat. 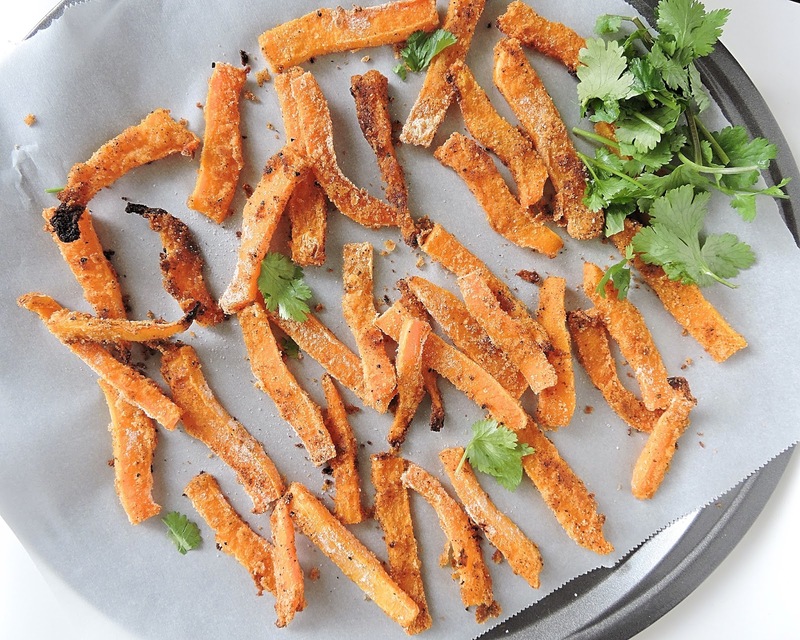 Pour the fries into a strainer & shake off the extra flour, leaving a thin coating behind. Place the fries back in the bowl. Add the avocado oil and spices, lightly tossing to coat the fries. Lay out the fries in a single layer onto a lined baking tray. Bake for 15 minutes, then remove from the oven and flip. Turn the heat up to 425ºF, and bake for an additional 10 to 15 minutes, until lightly browned. Remove from the oven & sprinkle with sea salt. 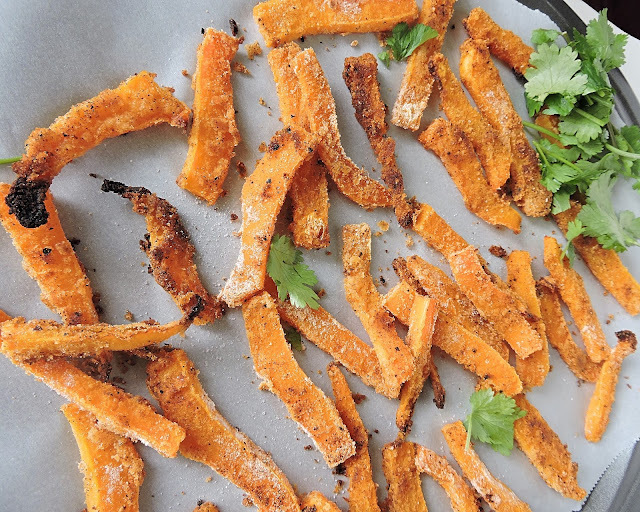 Allow the fries to cool for about 5 minutes on their baking sheet, then serve! 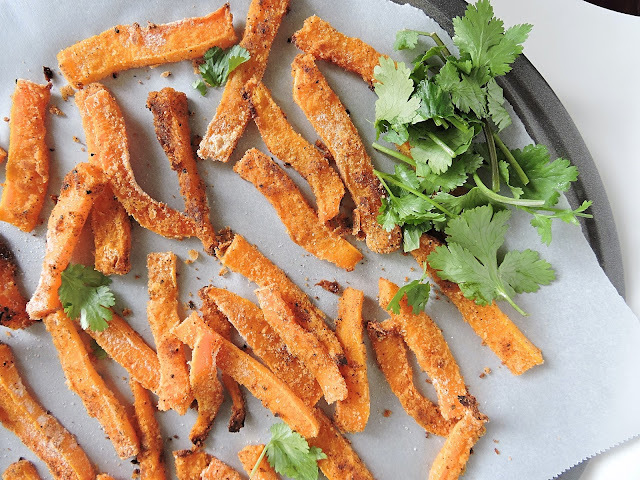 Peeling & slicing the squash can be a pain- but it's totally worth it for these yummy fries! 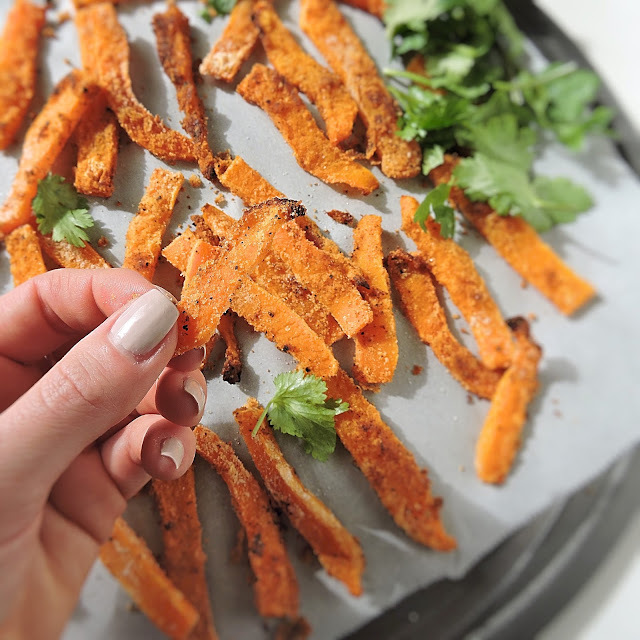 If you can find some pre-cut squash out there (like the crinkle cut pieces I've been seeing around, or even cubes) definitely save time & go for it, and skip steps 1 and 2.